Yesterday, Pugettia gracilis was the subject of the first Cryptic Crab Challenge on theoutershores’ facebook page. Elaine Blok submitted a correct identification 38 minutes after I posted the challenge, and got all the glory. In the Challenge, I showed two photos, the one at the top of this post, and this one. Had I shown only this one, Elaine might have had a tougher time of it. 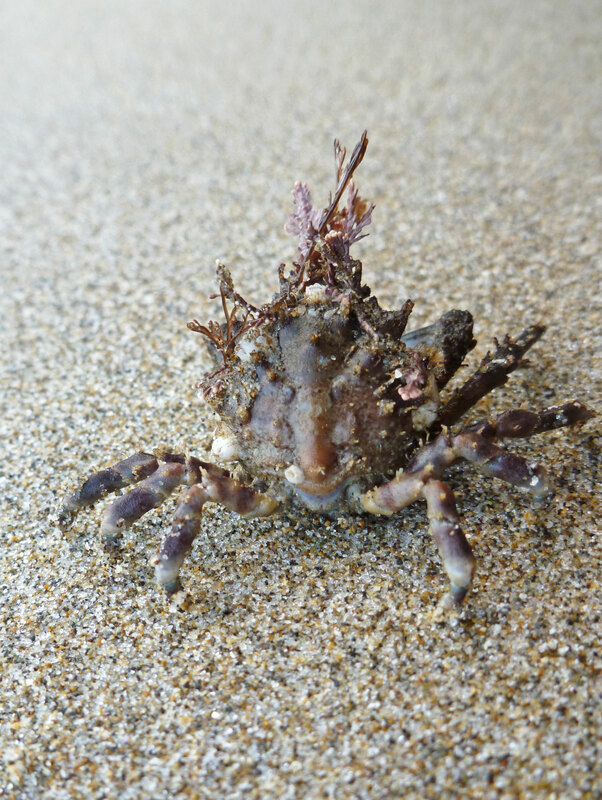 I found this heavily encrusted fellow hiding in a low intertidal assemblage of red and brown algae, on July 23, 2013. I still remember how strong it was – that must help with hanging on to its algal home in heavy surf; and, I remember how it kept trying to pinch me. 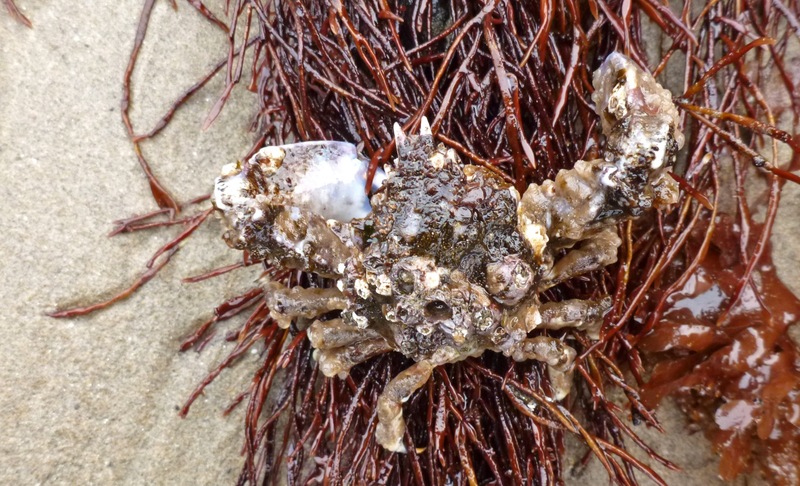 This one was so heavily encrusted, it was barely recognizable as a crab – makes me wonder if it had missed a molt. Its only clean surfaces, seemingly, were the lower extremities and tips of the pinching claws. 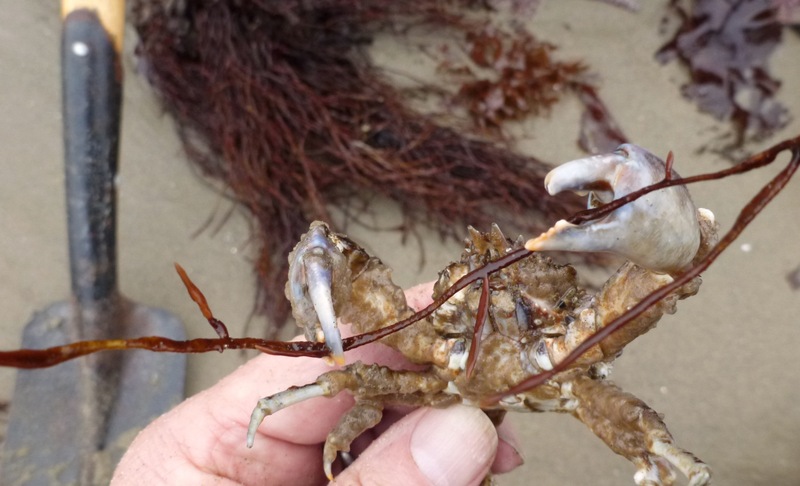 One of the ways to distinguish P. gracillis from other kelp crabs is the color of the claws – blue with orange tips. You might also notice that my grip is well back near the base of one back leg. Every other place I tried was in the pinch zone! Prev Have I Shown You My Chondrophore Collection? Gorgeous! Just love it! Thank your for sharing.